SKU: N/A. Category: Paternity Tests. Tag: Paternity Test. The Home DNA Kit gives you a peace of mind test is an affordable option for those who don’t need the DNA Test for Legal purposes. The actual testing in the laboratory is performed by testing a high number (24 regions) of DNA in each person. This is 8 more than the industry standard of 16 for ultimate in DNA testing accuracy. Additionally this test is powerful enough to determine which one of 2 brothers is the biological father of a child. In a standard paternity case (father, mother and child) the minimum paternity index for our test is 99.9999% in case of a match (inclusion) and we are able to exclude paternity with 100% certainty in case of a mismatch. 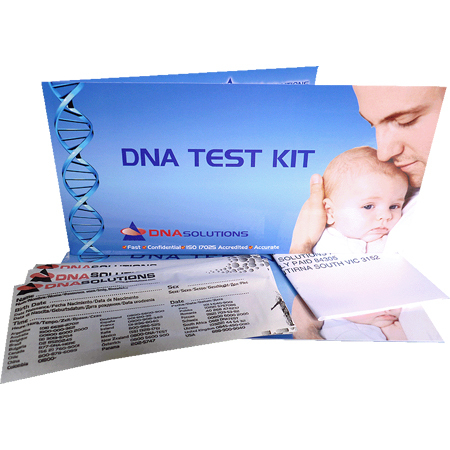 At DNA Solutions, we understand how stressful the wait for the results can be, for that reason we offer the quickest turnaround time in Australia, your peace of mind Paternity Test will be performed in 5 business days from the reception of the samples at our laboratory. By the rules of Australian Family law, for a DNA test to be recognised by law courts and the Government of Australia the DNA paternity test must be conducted by a DNA laboratory with NATA and ISO 17025 Accreditation. DNA Solutions is one such laboratory. Once you order the test, we organise for your samples to be taken by one of our Australia-wide locations and guide you through the paperwork required, which largely consists of completing a form and obtaining passport size photographs. There is a small fee of $50 per person for the collection of samples (which is charged by the collection centres and paid by DNA Solutions on your behalf). The result will have the NATA seals required by judges to administer rulings, and by Government departments (such as to change a birth certificate). DNA Solutions laboratory will test a huge number of regions of DNA in each person (24 regions), 8 more than the industry standard of 16. Any exclusions (tested as not the father) will be tested a second time! If you need your legal test for the purposes of Immigration, as requested by the Department of Home Affairs, click here. If you need a DNA test before birth DNA Solutions now can offer you a new prenatal paternity test that uses a normal blood samples from mother after nine or more weeks of pregnancy. You can order online today, or call us for more information. DNA collection from the mother and the alleged father included. *An additional payment of $600 is required before you receive your test results.